It's been a couple of month's since our last Tapas gathering, and everyone was ready to get together and share some food, some laughter, conversation, although at the beginning of the evening much of the conversations were about the close call from Hurricane Michael. I didn't host it this month, my friend Jill did and I'm very appreciative of her doing so. Her house looked so festive with all the holiday fall decorations. As usual, lots and lots of food was brought and shared and enjoyed. This dip was wonderful, and I noticed a lot of munching going on. One thing I've noticed over the years is that sometimes a Tapas will seem to have an unspoken theme going on. This month it was dips, cheeses and crackers. This goat cheese log was so good. These were some fish spreads from a little place in Panacea. They were so good. and of course, mustard's and mayo and cranberry relish to top them with. I had fun playing with my food again, I made a Forloren Hare (Danish Meatloaf) and tried to make it look like a mummy face. This yummy baked pasta dish. I swear I thought I hit the jackpot last night, there were two pasta dishes, this Mac and Cheese was presented as well. And I threw together this cake. I had some cake in the freezer and some leftover black frosting so I whipped up a quick Orange Curd, sliced the cakes, slapped the orange curd in between the layers, and then frosted it. And all in all, another successful Tapas Time. Worth the increase on the scale this morning. Best of all, spending time with friends, sharing stories and visiting. This used to be one of my favorite meals that I learned how to make back when I was a Girl Guide. And I'm still kinda amazed at how much I liked it, mainly because back then, I really didn't care for vegetables. I got to revisit my past a little this past week or so. We were without power for several days following Hurricane Michael's onslaught onto the Forgotten coast. Luckily we had a generator which we ran three times a day to keep the fridge and freezer going. But it also meant that I had to resort to cooking my meals on either a two burner hotplate which the generator could handle just fine, or out on the grill. I'm so thankful for that gas grill, I cooked a couple of meals on it. One night we had hamburgers, and they tasted wonderful but on another night I made something from my past, Hobo Dinners. We'd invited a neighbor in and we feasted on these. And while I'd love to say that there is a hard and fast recipe for these, in reality, you make them to your taste. I had some lovely heirloom carrots and in the picture you can see a purple one, but I ate that one, raw. I love carrots. So here's the basics. And the recipe. This is a fun recipe, and it tastes great. I made it on the grill, but you can also bake these in the oven. Peel and slice the potatoes, carrots and onions. Mix the butter into the meat and form into four patties. This provides a little fat and imparts a richness to the finished dish. You can also use a fattier grind of meat if you like, just don't add the butter. 85/15 works well. Take two sheets of foil about 10 inches long, out per meal if cooking these on the grill or just one sheet per meal if making in the oven. Spray the foil lightly with some cooking spray. Place the onions, potatoes and carrots on the foil, top with the hamburger patty and season with salt and pepper. Fold the foil over the meal and seal by folding over the top. If making these on the grill, add another sheet of foil, sometimes the first layer can burn through. You can also top the meat with a dollop of mushroom soup or prepared gravy if you like, before you seal up the packets. I got carried away and forgot to do that before cooking these and just served the mushroom soup as a topper. Cook on the grill for about 20 minutes or until the potatoes are cooked through. You can also bake them in the oven for 25 minutes at 350 degrees. Serve on the foil for a truly rustic, campfire meal. You can also cook these in the coals of a campfire for a true campfire meal. I wasn't sure I was going to be able to participate this month. We had a bit of a hurricane last week, you might have heard about it? Hurricane Michael hit just about 50 miles from us, at one mile shy of a Category 5. We were without power for a few days, and I just didn't think this was going to come together at all. But here I am, and here's my take on the theme for this month, which just so happens to be a Fall Stew, Comforting Fall Stews that is, this event for Soup Saturday Swappers is hosted by Colleen of Faith, Hope, Luck and Love Survive Despite a Whiskered Accomplice. I'm there. Even if here in Florida, we're not exactly cold yet. I'm told that the 90's, temperature wise that is, are almost behind us. I went here for my inspiration, but I did change it up. I used some lovely pork stock, and didn't put in any zucchini, or basil or orange zest which the original recipe called for and I have to admit to upping the spices a touch. I didn't add any chicken either. I used some of the pork I'd made the stock from. Waste not, want not. Besides which I love pork. Sautéeing the onions with the spices actually brings out the flavor more than just dumping them into the pot. It looked good, but needed, something. So I popped outside, picked some chives, and sprinkled them on top. After adding the cooked pork and some creme fraiché. And I think this could also be made totally vegetarian as well, just by subbing out the pork stock for some vegetable stock. This warm, rich soup tastes fantastic,even the weather is hot out side. Heat a large heavy bottomed pan over medium heat. Add oil to pan; swirl to coat. Add onion, and cook for 4 minutes, stirring occasionally. Add butternut squash and tomato paste, then add the cumin, cinnamon, and pepper to pan; cook 1 minute, stirring constantly, cook 1 minute. Stir in Pork Stock, scraping pan to loosen browned bits. Bring to a boil. Reduce heat, add the butternut squash and simmer 10-12 minutes. Stir in couscous, salt and cook 5 minutes or until squash is tender. Add the chopped cooked pork, just to warm through a little. Remove pan from heat. Serve with some Naan, or a crusty roll and float a little creme fraiche on top and a sprinkle of chopped chives. I had fun racking my brain for what to make for this month's #FishFridayFoodies theme. Our hostess this month is Stacy of Food Lust People Love and she suggested Seafood Fillings. I was actually doubtful that I would even participate in this but then got that AHA!!!! moment, and I knew what I wanted to make. And since I was going to a potluck this past week, I decided to go ahead and make it. I've been working on a new crab cake recipe and almost had it right the last time I made it, but something was missing, but I got it now. Boy do I got it, and I'll share the full Crab Cake recipe later on. But for now, it's Fish Friday Foodies time and it's time to use a seafood as a filling. I think my crab cakes are perfect for these little bites of YUM. Stir the Curry Paste, water, egg and fish sauce together. Place the shrimp into a small food processor and process to a paste, leaving a few chunks of shrimp. Place the crab meat, shrimp and panko into a bowl and mix together. Add the egg, fish sauce, curry paste and the water, mix together. I like to place a glove on my hands and use my hands to toss it together, this ensures an even mix, without mooshing it together too much. Set in the fridge for a minute while you prepare the mushroom caps. Prepare the mushrooms by taking out the stems, but don't throw them away, reserve for another use. Scoop up a tablespoon or so of the crab mixture, using a small scoop and place on the inside of the mushroom cap. Bake at 350 degrees for about 20 minutes or until the mushrooms and crab/shrimp mixture is cooked and is browned a little . (If they don't look too browned, turn the temp up to 375 degrees and bake an additional 3-5 minutes). Although if you go in the stores you'd think that Christmas is just around the corner with all their decorations out, but, no, Halloween is first on the calendar. And I've got a few ideas for you. I like the sweet stuff, but am also a big fan of savory foods. Every year, I make what my DH calls 'Eyeball' Stew. This became a tradition many years ago during a Halloween potluck. The small pickling onions do resemble peeled eyeballs, and the bacon in stew can also be called various things, and of course, what self respecting Halloween stew wouldn't have fungus in it as well. All I know is, this tastes great with some crusty bread or rolls on the side. I call this Vampire Blood Tapanade. It sorta looks like coagulated blood or what might happen to a vampire who eats garlic. Everyone's up for Deviled Eggs right? 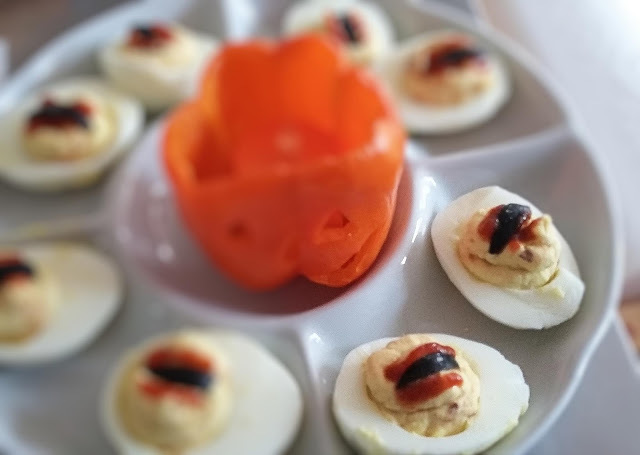 Well, how about some Tate's Hell Snake Eye Deviled Eggs. These disappear fast when I make them. I also like to dip things like oh, my Spicy Witchy Fingers, but when I dip them, I want something good to dip them in. This Green Spider Dip works really well. I guess you could also dip Pita Chips in there as well. Or you also use these Garlic Twists for dipping purposes. 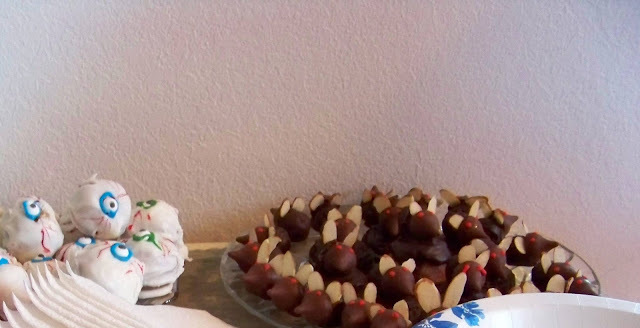 I guarantee you'll get some second or third looks when you bring this to the party. And finally for the people who have a sweet tooth. May I offer you some Mice and Crunchy Eyeballs? Now I need to get busy, I've got a great idea for a new fun dish to make this year but I don't want to spoil the surprise just yet. Gotta save something for later. I really don't know how to start this. We had our monthly Potluck last Monday, October 8th, and had a slightly lower than usual turnout as there was a hurricane in the forecast and some people had already left to go inland. We've been meeting at a different boat club than we used to meet at, and it was a good place to meet. 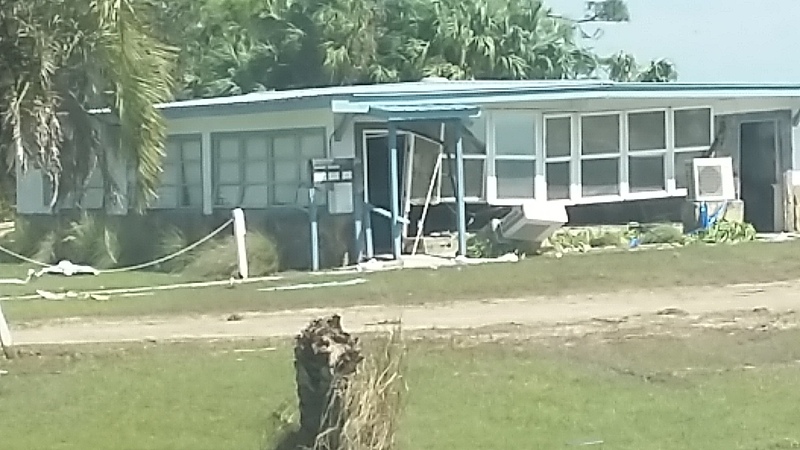 We had a hurricane come through our area two days later, and the boat club building we were meeting at, is no more. It was decimated by the storm surge. But as I said before, we did have a few people, and they brought some great food as usual. This Moroccan Chicken dish made with preserved lemon, so good. And Meatloaf, be still my beating heart. And it was very popular. I made some Thai style crab and shrimp stuffed mushrooms (recipe coming on Friday) as well as some crab cakes. This was the view from the Boat Club that night, the calm before the storm. Cliche, I know, but while we knew there was something out in the gulf, we had no way of knowing that the maybe Cat one or two Hurricane Michael, would blow up into a devastating Category 5 hurricane which would decimate so much of our Panhandle. So many lost everything. and here it is now. So sad to see this, there was so much destruction after the storm in this area.